$7 Shipping Over $50 Apply Coupon Code 7SHIP at checkout. Not valid on prior orders. Receive $7 standard shipping, via our choice of carrier, on your order over $50 of select items. Offer applies to a single, completed order shipped to a single address within the contiguous USA (Alaska, Hawaii, APO, FPO, DPO & US Post Office boxes do not qualify for this offer). Multiple destinations or split shipments on a single order - including back-ordered items - will incur additional charges. Larger boxes, International Shipping, Express Shipping, Signature Services (signature required upon delivery) and Customer Preferred shipping methods may also incur additional charges. Offer not valid on doll stand purchases. Offer subject to change. A gift certificate is a perfect gift! Free Standard Shipping On Orders Over $99 Apply Coupon Code FREESHIP at checkout. Not valid on prior orders. Receive FREE standard shipping, via our choice of carrier, with your order of $99 or more of select, clearly marked items. Offer applies to a single, completed order over $99 shipped to a single address within the contiguous USA (Alaska, Hawaii, APO, FPO, DPO & US Post Office boxes do not qualify for this offer). Multiple destinations or split shipments on a single order - including back-ordered items - will incur additional charges. Larger boxes, Heavier boxes, International Shipping, Express Shipping, Signature Services (signature required upon delivery) and Customer Preferred shipping methods may also incur additional charges. Offer not valid on doll stand purchases. Offer subject to change. Call us for complete details. Receive a FREE Steiff Bear Cart with your order of $600 or more - only at The Toy Shoppe! This offer may not be combined with other offers. Other restrictions may apply. Call us for complete details. This is a limited time offer and is subject to change. No coupon necessary. Receive a FREE Steiff Keyring with your Steiff order of $250 or more - only at The Toy Shoppe! Please tell us in the COMMENTS FIELD at checkout your choice of FREE Teddy: WYATT, MARGOT, AGATHA, CECIL or NELLIE. Receive a FREE Teddy bear with your new order of $450 of Charlie Bears at The Toy Shoppe. Choose from Wyatt (57161), Margot (57130), or Nellie (57135), Agatha (57088), Cecil (57103). Shop our Charlie Bears to take advantage of this special offer. Not valid on prior orders. Cannot be returned or exchanged for monetary value. May not be combined with other offers. Subject to change. One free Teddy per customer. Other restrictions may apply. Call us for complete details. Receive a FREE Two Tiny Eggs with every $100 you spend on Wee Forest Folk at The Toy Shoppe, a $20 value each. Offer not valid on prior orders. May not be combined with other offers or exchanged for monetary value. While supplies last. Offer subject to change. Colors will vary. Narrow your choices . . .
All Sizes less than 10" 10" - 20" 20" - 30" over 30"
Use coupon code FREESHIP at checkout.Not valid on prior orders. Receive FREE standard shipping, via our choice of carrier, with your order of $99 or more of select, clearly marked items. Offer applies to a single, completed order over $99 shipped to a single address within the contiguous USA (Alaska, Hawaii, APO, FPO, DPO & US Post Office boxes do not qualify for this offer). Multiple destinations or split shipments on a single order - including back-ordered items - will incur additional charges. Larger boxes, Heavier boxes, International Shipping, Express Shipping, Signature Services (signature required upon delivery) and Customer Preferred shipping methods may also incur additional charges. Offer not valid on doll stand purchases. Offer subject to change. Call us for complete details. Started in 1972 by Annette Petersen in her old-fashioned kitchen on a farm in Carlisle, Massachusetts, Wee Forest Folk® is a small family business that delights in producing amazing entirely handcrafted miniatures, mostly mice. Annette is amazing at the very spry age of 92 years young and is still sculpting and working at the mouse factory. Willy and Donna Petersen (pictured above) continue to create these wonderful characters at their workshop in Carlisle, Massachussets. A tiny original piece is hand-sculpted in clay by one of the Petersens then hand cast. Talented artists bring each tiny sculpture to life with meticulously detailed and delicate features. An enormous amount of time and patience is invested in each creations and everyone involved takes personal pride in the quality of their work. Wee Forest Folk sculptures are 1 to 2.5 inches in height. Each little treasure is handcrafted entirely in Carlisle, Massachusetts. A Wee Forest Folk mouse begins as an original clay piece which is hand sculpted by one of three sculptors in the Petersen family. The finished sculpture is molded and hand cast at the "mouse factory" in Carlisle, MA. Carefully selected artists flawlessly paint each one by hand bringing to life a sweet little mouse personality. Wee Forest Folk began as a cottage industry in 1972 and it continues to this day. Growing up surrounded by their mother's creative influences son, Willy and daughter, Donna began to develop their own artistic talents. After graduating from college in the late 1970's, both joined their mother's enterprise and the next generation had begun! All three family members have their own style as sculptors and are very supportive of each other's creative endeavors. 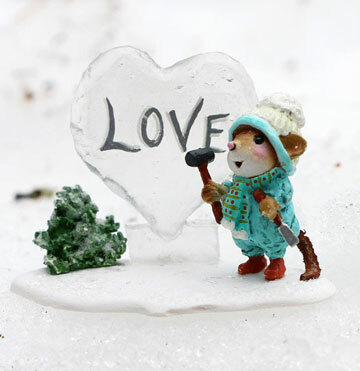 The Petersens feel especially grateful to have the opportunity to use and express their creativity in making these tiny and charming mouse miniatures and they extend their warmest appreciation to all of their collectors. The Toy Shoppe is your best shop to buy Wee Forest Folk mice and other miniatures in the USA. You'll enjoy shopping the huge selection of new Wee Forest Folk mice, retired editions, holiday editions, and special editions at The Toy Shoppe. We offer a great selection of Wee Forest Folk mice and editions ready for immediate shipping. If you are looking for hard-to-find retired editions, call us toll free at 1 800 447-7995. We have a great selection of rare, retired editions. Shop The Toy Shoppe for the finest selection of Wee Forest Folk mice, bears, bunnies and delightful animals! Since 1975, The Toy Shoppe has offered the finest Teddy bears and animal friends from around the world. Our interest-free flexible payment plans are easy and make your collecting fun and stress free. And you won't find a more knowledgable, friendly staff than at The Toy Shoppe. Visit us in Richmond, Virginia. Our gallery is conveniently located and a quick stop when travelling through Virginia. Click on the "view larger" link below the map to get directs through Google maps. We look forward to meeting you in person! "A Wee Forest Folk mouse begins as an original clay piece which is hand sculpted by one of three sculptors in the Petersen family. 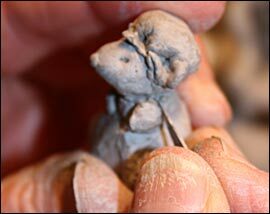 The finished sculpture is molded and hand cast at the "mouse factory" in Carlisle, MA. 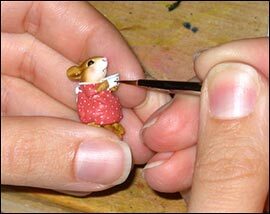 Carefully selected artists flawlessly paint each one by hand bringing to life a sweet little mouse personality. [Annette's] first mice were made of bread dough, but they didn't last very long - nibbled by the real thing, of course! Eventually she learned to sculpt her little friends in clay and cast them in a more durable casting stone." Signed up for your Toy Shoppe emails, yet? You'll be the first to hear about new doll editions that will capture your heart, fun and adorable teddy bears, and special offers and savings that are only at The Toy Shoppe. Just enter your email address below to join and we'll start sending you surprises soon!. Yes! Sign me up for Toy Shoppe eNewsletters! Images, text and all other content ©copyright 2019 by The Toy Shoppe. • All rights reserved • Reprint permission must be granted in writing.